Every skier has his or her own ski-related fantasy. For some it’s skiing first descents in AK, for others it’s a bluebird spring day with his family, for me, it’s always been one thing: blowing up some cornices with large quantities of explosives. Last week, this fantasy came to fruition when the La Parva Snow Safety Crew offered to take me on their dawn patrol control route after a meter-plus dump. Although it took some convincing, I assured the operations department that I was safe (true), well versed in avalanche control work (semi-true), and that this was no big deal in the states (definitely not true). We awoke at 4 a.m. to skies that were still socked in. For a moment I thought we were going to get skunked and my dream would have to go unfulfilled. A quick call to the Snow Safety Supervisor and we were on our way to the hill and the clouds were lifting up top. The snow cat ride up was an adventure in itself. While I had envisioned an enclosed bed or at least a cage on the back of the snow cat, in the “Chilean Spirit” there was nothing but a flat bed and a couple of handles. The next hour was nothing short of terrifying: When the ten of us in the back weren’t being soaked by snow liquefied by the piping hot exhaust, we were holding on for dear life as the snow cat would side-hill and nearly throw us off the slick flatbed. But we made it to the top and were treated to the sun rising over a crystal-clear view of Santiago, which is usually obscured by heavy smog. Over the last several days Mother Nature had produced some impressive over-hanging cornices; safe to say, I could not wait to destroy them. 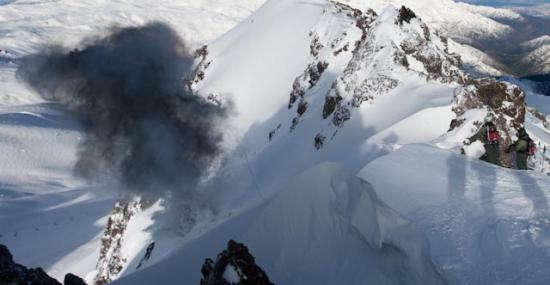 The first explosion was the best: sitting there grinning with nervous anticipation for the soul-shaking “BOOM” that every skier knows as the precursor to an incredible day in the mountains. Although I knew it was coming the explosion still startled me. I followed it up with a tremendous “Yankee howl,” the noise that is apparently unique to Americans who ski. We worked our way down the ridges, dropping countless kilos of dynamite, fulfilling the fantasy that I’d been creating in my head for the past 20-plus years as a skier. The last area of control was in sight of the growing lift line at the base and would provide an untracked run in three feet of Chile’s finest. We threw the last couple of charges and, in true ski patrol fashion, skied the best line to the bottom, much to the envy of the hundreds gathering in the lift line. I believe I was grinning as much from the experience itself as the bottomless powder.